Daddy-Long-Legs by Jeanne Webster. Looking Glass Library. Review: Letters, money and pictures. 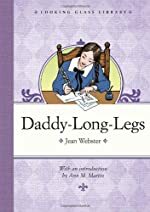 Daddy-Long-Legs by Jean Webster shows the importance of education and values through letters involving Jerusha Abbot (Judy) and a benevolent and wealthy trustee. Daddy-Long-Legs begins with Jerusha as a seventeen year old in an orphanage asylum. Because her high school grades (particularly her writing) are very high, she gets to go to college. So, a wealthy trustee gives Judy a chance for college with only one requirement; that she writes to him monthly about her education and life. Daddy-Long-Legs is the nickname she gives the mysterious trustee. Throughout her schooling, Judy faithfully writes Daddy-Long-Legs, sharing with him the good and the bad. She writes about her struggles in school and about her wonderful trip to Lock Willow farm for the summer. She even tells him about Jimmy McBride, a boy she's come to like. After completing her education, Jerusha gets a wonderful surprise - she gets to finally meet Daddy-Long-Legs - her wealthy trustee. Although I didn't enjoy this book much, you might. Daddy-Long-Legs was probably intended to be read by 8-12 year old girls. Unfortunately, I'm not a girl, but if I were, I would most likely rate Daddy-Long-Legs a 4 out of 5. You do need to read the book to find out why she calls him Daddy-Long-Legs because that is interesting. Something that I didn't enjoy in reading this book is the format the author used, mostly because the book is totally written through letters. Plus, in one of the letters, Jerusha uses French, instead of English, which makes it hard to decipher. However, the storyline is the second best part of the whole book. In other words, the story is good, but the fact that Jean Webster wrote it as a bunch of letters was distracting to the plot. I do know, though that a lot of people love reading books like that, so if you enjoy reading letters, it's the book for you. My favorite part of the book is the pictures that she draws in her letters to Daddy-Long-Legs. We would like to thank Random House for providing a copy of Daddy-Long-Legs for this review. Have you read Daddy-Long-Legs? How would you rate it?